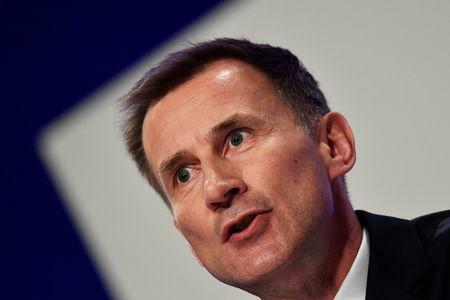 LONDON (Reuters) - Britain is to hire nearly 1,000 more diplomatic staff as it looks to expand its links with countries around the world after Brexit, Foreign Secretary Jeremy Hunt will announce on Wednesday. They will comprise 335 new positions overseas, 328 in London and 329 new local staff around the world. It will also create 12 new posts, either embassies or missions, with a new embassy in Djibouti and the upgrading of the office in Chad to a full embassy. "Our democratic values are arguably under greater threat than at any time since the fall of the Berlin Wall ... we can use our influence, reach and power to defend our values," Hunt will say in the speech entitled "Britain's role in the world after Brexit," according to advance extracts. "We must reinvigorate and expand British diplomacy," he adds.